Sarah Burton, Alexander McQueen’s protege, had some very big shoes to fill during Paris Fashion Week this year. She debut her first collection after Alexander McQueen’s tragic and untimely death. The show represented a re-birth and served as a tribute to the brilliant Mr. McQueen. 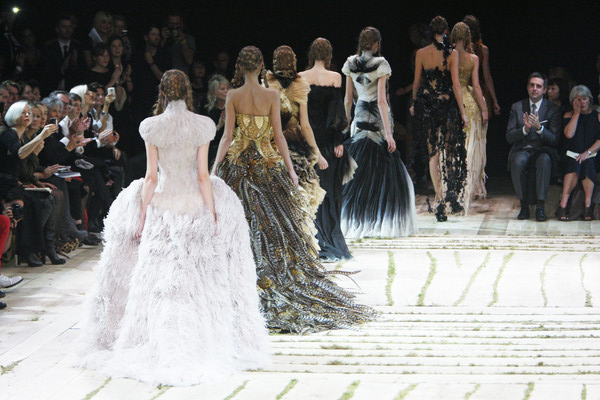 Sarah Burton, a quiet powerhouse, worked closely with McQueen for 15 years. She shares his same visionary approach. Her dynamic and captivating show proved that she has the ability to carry out his legacy. Burton slightly softened everything including the staging. She embraced a nurturing atmosphere, reminiscent of a pagan, inspired by Mother Earth. The models were reclaimed by nature, wrapped in leaves of black leather, the wings of a monarch butterfly or an enveloping mass of feathers. Colorful prints in orange and ochre were combined with black and white. 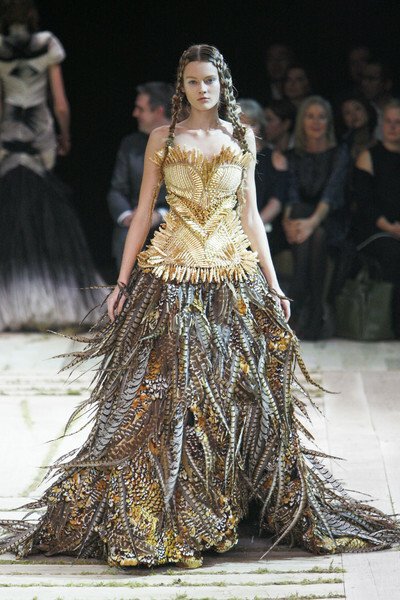 The craftsmanship was stunning from the monarch butterfly dress to the skirt of pheasant feathers to the gown of pleated organza the work was truly impeccable. Burton showed baroque-details, golden embroideries, high collars and pointy shoulders. Adam Markian, a good friend of mine, and a freelance editorial hairstylist in New York, worked with renowned hairstylist Luigi Murenu at the Alexander McQueen show. 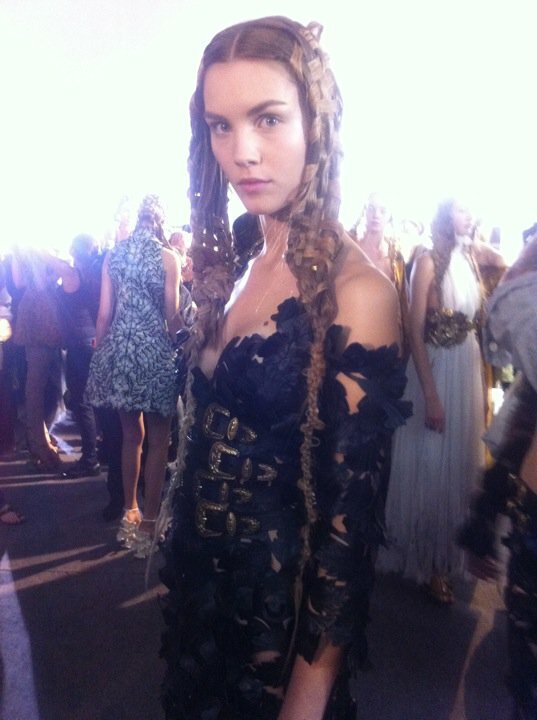 The team transformed the models into nymphs, with braided hair like a woven wicker basket that looked absolutely stunning. Luigi, Adam and team worked at over 14 other shows during Fashion Week (including Louis Vuitton, Valentino and Miu Miu), their work is absolutely awe-inspiring! Check out Adam’s Website to see more of his incredible work. I met Adam after the show wanting all the juicy details. I was incredibly moved by the impact and magnitude that the show had on everyone. Adam’s incredible stories gave me goose bumps. There was not a dry eye in the house. It was quite a monumental and emotional event that left models hugging, the audience weeping and above all a deep love and respect for Mr. McQueen. Fashion editors were impressed by Burton’s success in building a collection that was true to the spirit of McQueen, while keeping the dramatic silhouettes for which he was famous, but introducing a more feminine, romantic side. 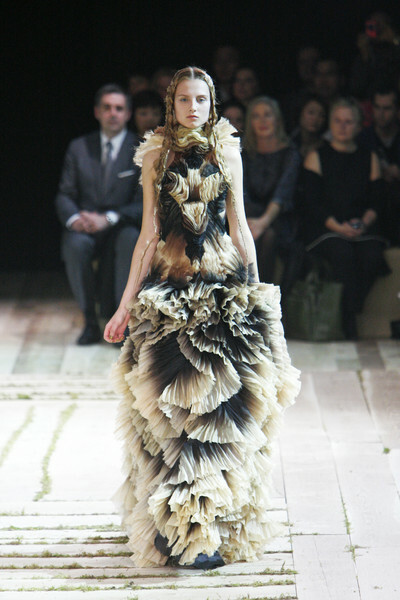 Job well done Sarah Burton, Alexander McQueen would be proud!